I have been blessed with the desire to create from an early age. Like many a young child, I was taken by the joy of turning the sidewalk in front of our house into my own little artistic playground. I spent countless hours with nothing but chalk, my imagination and the Brooklyn concrete as my canvas. While it is common for artist to specialize in one particular genre, I am drawn to many. I may spend several months with my sculpting hat on, but in the back of my mind, oil paint is calling. And as I cover the canvas with various oils, the pencil is never far away. I take a completely organic approach to my artwork, making sure to incorporate the various elements of nature, feeling and emotions while continually striving to express my life’s experiences into my craft. Since receiving my Bachelors of Fine Arts from the School of Visual Arts in 1974, my sculptures, lithographs, and drawings have been exhibited in prestigious galleries and exterior locations throughout the greater New York City area as well as overseas. In 1976, I had my first solo show at the Alternative Space Gallery on West Broadway in the Soho section of New York City. In October of that same year, I showed in another solo exhibition on Madison Avenue at the Paul Stuart Gallery. In 1982, I was the recipient of the Hudson River Museum Award and in 1984, I was awarded a one year fellowship to P.S. 1 in New York City. 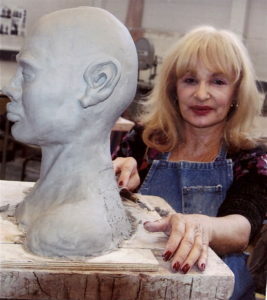 From 1979 through 2009, I committed myself to teaching children with disabilities sculpture and fine arts. It was always my passion to guide and empower children to be creative and expressive individualism and I felt that this was especially true with the special needs population. I enjoy the therapeutic healing, sense of joy, pride and accomplishment that creativity brings to them.